Recommending fruits to take medicinally is pretty tricky, as they are generally high in sugars, which have negative impacts elsewhere in the body. Several fruits are high in antioxidants, nutrients, and enzymes, however most of the common domesticated varieties of fruits that you can buy in the grocery store offer little medicinal benefit and, for people with compromised glucose tolerance, may do more harm than good. So the following list of medicinal fruits is pretty short, as significant fruit-eating is not recommended for people with glucose intolerance, bacterial overgrowth in the gut, mucus problems, or infections. Lemons, Limes, Citrus Peel – In addition to their high vitamin C content, citrus fruits have a wide variety of other antioxidants and nutrients. Oranges have more than 170 individual phytonutrients identified so far, and 76% of its antioxidant value comes from compounds other than vitamin C. One of these phytonutrients is called hesperidin, which in animal studies has been shown to relieve depression, calm inflammation, protect DNA from radiation damage, and slow cancer growths. However, most of the beneficial compounds in citrus lay not in the soft inner flesh, but in the rind and the pith, the spongy white tissue that lies on the inside of the rind . Eating the sweet inner flesh of oranges and other sweet citrus (tangerine, grapefruit, clementine, etc.) is contraindicated for mucus conditions and infections, however the peel is of great medicinal value as it does not contain much sugar and is full of infection-fighting, anti-inflammatory compounds. The rinds of oranges, grapefruits, lemons, and limes are particularly useful. In Chinese medicine, citrus peel is used to regulate the pancreas and digestive energy, alleviate intestinal pain and indigestion, and to resolve mucus congestion in the lungs. The best way to use the peel is to simmer it in water, fresh or dried, for about 20 minutes and drink it as a tea . You can also grate the rind as a “zest” and add it to any dish for extra flavor and nutrition. Because limes and lemons have so little sugar content, it is fine to eat the entire fruit including the inner flesh. The oils in the rind are particularly beneficial, however. Lemon’s anti-bacterial, anti-viral, and antiseptic characteristics are very well known, and studies have shown that they are also very effective at killing cancer cells compared to other fruits, second only to cranberries . Both lemons and limes are used in Chinese medicine to treat infections, resolve mucus conditions, and fight colds, flus, and parasitic infestations. Lemons and limes also encourage the secretion of bile for fat digestion and improve the assimilation of minerals from food. Furthermore, lemons/limes are cleansing, can alleviate gas and indigestion, increase the production of yin fluids in the body (thinning out our mucus), and are used to treat diabetes . So as you can see, lemons and limes are by far the number one most beneficial fruit for CF! You can add slices to your tea or drinking water to sip throughout the day. You can add them, rind and all, to your smoothies or homemade energy bars, you can bake with them, add their juice to a stir fry for a little tang, or grate the rind onto any dish as a “zest”. Lemons, limes, and citrus rind can be used very liberally. Include some aspect of them into your diet every day. There are several very important points to note when using citrus and citrus rind. First, only organic citrus should be used when you are eating the rind, as conventional citrus production is highly pesticide intensive and a significant amount of those pesticides are absorbed into the rind of the fruit. The negative consequences of ingesting all of those pesticides laden in the peel may completely outweigh any medicinal benefits you receive from their phytonutrients. Second, vitamin C is destroyed with heat (although several other antioxidants will survive) so limit the amount of heat your citrus is exposed to if you’re trying to get all the medicine out of it. 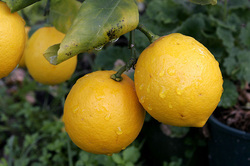 For example, slices of lemon in very hot water may destroy its vitamin C, but in warm or cool water you should be fine. Another little factoid to know: limes are ripe when they’re yellow! Also, citrus fruits do not ripen after they are picked, so choose the ripest, juiciest ones in the store. Give them a squeeze, and if they’re a little soft that means they’re ripe. Berries – There are several types of berries that may be beneficial when eaten in small quantities to limit their impact on our blood sugar. The most nutritious of the berries include blueberries, blackberries, black raspberries, and cranberries. Raspberries and strawberries are also high in antioxidants and phytonutrients. Compared to many other fruits, berries have less sugar and a lower glycemic index, plus they often have a positive glucose to fructose ratio and limited sucrose , making them a better choice when dealing with fructose malabsorption and gut dysbiosis. The darker-colored berries, particularly blueberries and blackberries, are the most nutritious of the bunch, having the most antioxidants and phytonutrients. The wild varieties of these berries are much more nutritious than the domesticated varieties, so go foraging for blackberries in the late summer or choose to buy wild frozen blueberries in the store when you can. Blueberries, like purple carrots, seem to be the antidote to the diseases caused by the Standard American Diet. They slow tumor growth, lower blood pressure, reduce arterial plaque buildup, and most importantly, cool inflammation. They also help prevent diabetes and obesity. Recently studies have shown their remarkable ability to slow age-related dementia, and significantly improve cognitive function and memory in the elderly . As fantastic as blueberries are, blackberries are even more outrageously nutritious. Their antioxidant content is higher and they have a lower glycemic index. Of the varieties of cultivated blackberries, marionberries are the most nutritious. Cranberries have one of the highest antioxidant levels of all fruits, and their red color is from the pigmented antioxidant anthocyanins. Cranberries are powerfully anti-bacterial, and studies have shown that they are very effective in clearing urinary tract infections and killing a number of food-borne pathogens, namely staph, listeria, and E. coli. Dried cranberries have only 20% of the antioxidant capacity of fresh or frozen berries, and cranberry juice has about half of the phytonutrients of the whole berry. Studies have also shown that cranberries fight Helicobacter pylori , the bacteria that causes ulcers in the stomach and duodenum, and can lead to dysbiosis in the intestines caused by low stomach acid. Cranberries make it harder for H. pylori to attach to the mucous membranes of the GI tract, reducing the risk of infection. Cranberries must be bought organically as conventional cultivation uses a significant amount of pesticides that not only poison the environment, but stick around on the fruit to poison you too. Cranberry harvesting is from October to December, so buy them fresh and freeze them. Dried cranberries and cranberry juice are not recommended because both are usually heavily sweetened either with sugar or apple-juice concentrate, which is high in fructose. Unsweetened cranberry juice is fine, but lower in antioxidants. Add cranberries to smoothies, bake with them, or make homemade jam and compotes. One last note: be aware that all berries contain a significant amount of histamine, so if you are histamine intolerant, you may have to hold off on the berries until your gut heals.